Legendary # 14 turns 65 - Congratulations! 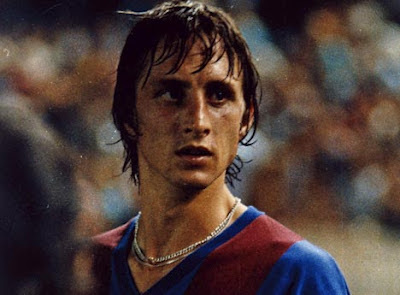 Through his career, Cruyff became synonymous with the playing style of "Total Football". It is a system where a player who moves out of his position is replaced by another from his team, thus allowing the team to retain their intended organizational structure. In this fluid system, no footballer is fixed in their intended outfield role; anyone can be successively an attacker, a midfielder and a defender. The style was honed by Ajax coach Rinus Michels around the time Cruyff came to prominence. Cruyff was a playmaker, ammunitions provider and marksman rolled into one, with the ability to time a pass that has hardly "been equalled before or since". Strictly speaking, Cruyff played centre forward in this system. But he would drop deep to confuse his markers or suddenly move to the wing with devastating effect. No one had seen a centre forward like that before. Due to the way Cruyff played his game, he is still referred to as "the total footballer."